Granted, Catherine is big chocolate fan (which is why I knew she’d love these bars), but I have to agree with her that they’re pretty amazing. Without question, they’re rich. But at least in bar form you feel a little less guilt since they’re small. And now that the sun is finally back in San Diego, I’m finding the opportunity to make desserts without having to turn on the oven very appealing! Line a 13 x 9 inch pan with foil, with ends of foil extending over sides. Mix graham crumbs, butter and 2 tablespoons sugar; press onto bottom of pan. Refrigerate. Melt 6 ounces of chocolate (6 squares, if you’re using Baker’s) as directed on package; cool slightly. Beat cream cheese, 1/2 cup sugar and vanilla in large bowl with mixer until well blended. Stir in whipped topping with whisk; pour half into medium bowl. Stir in melted chocolate. Pour over crust; cover with remaining plain batter. Melt remaining chocolate; drizzle over batter. I forgive you for using the storebought kind (LOL!) only because these bars look AMAZING!! What a great treat. I kinda like Cool Whip too! Just used some in a version of dirt pudding I made last week. I know it’s terrible but I can’t help but secretly love the stuff. These look heavenly and sinful at the same time. Is that possible? This looks amazing and wonderful, but TWO POUNDS of cream cheese? Really? Four of those bricks? I just ask because it does sound a touch heavy for an unbaked cheesecake. I really want to make this… but really? It’s what the recipe calls for! I’m guessing it’s a little on the dense side so that you can more easily cut it into bars? But it didn’t taste like a brick of cream cheese, then? 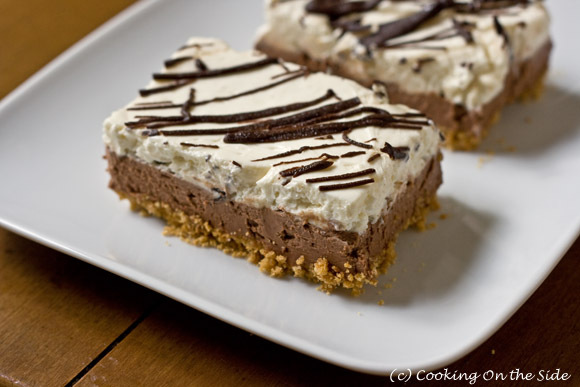 My mother made no-bake “cheesecake” when I was a kid. That’s all she served. So this seems like it might be a slice of my childhood… only chocolate flavored! Oh my gosh, do these look great! And I hear ya on the whole “not turning on the oven” thing. It’s been crazy hot here, and hubs about freaked tonight when I decided to bake a cake anyway (hey, I waited until after sundown). Anyway, this looks great, Kathy. They are going on my to-make list! oh man, i’m totally gonna try these. i have all this cream cheese, but i can’t even fathom the idea of heating things up with the oven right now. bookmark! update — i totally just made this, but now i can’t wait until tomorrow when it’s chilled and i can eat it. i had no cool whip though, so i made the whipped cream from scratch. I’m definitely interested to find out how it works with real whipped cream! i realized i goofed on the recipe and made it a bit differently, but see my blog — i think it turned out really yummy, just not quite the way it was supposed to be. thanks again for such a great post. i gave you a couple of shout-outs in my post. Yours came out terrific! I’ve never heard anyone complain about a whipped cream layer on their dessert. Thanks for the shouts! A perfect cool treat for a hot summer day! Wow. These bars look fantastic. My girlfriend’s oven is not connected yet because it is new, so I could make this for my stepdaughters! I will have to subtract the chocolate, though, since I don’t have anymore of it. Also, I have to use real whipped cream haha. I like Cool Whip, too, but the homemade kind is just too simple to make and tastes so much better. Thanks for this great recipe! I apologize for replying to this post twice!! LOL! I guess that shows how much I want to make these babies. Hi, just recently found your blogs, and am really enjoying reading them. 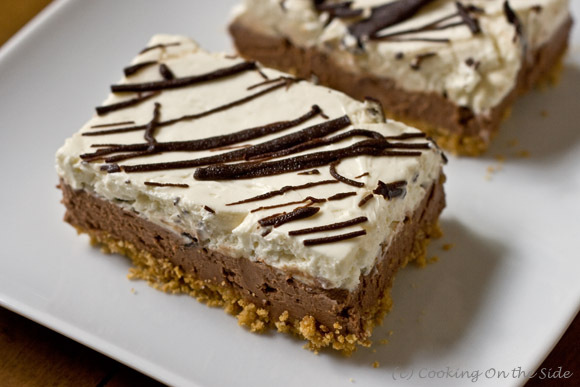 I saw the ‘no bake’ recipe and had to try it (my oven is on the fritz right now- boo). My dd 16 & I made this recipe, and I thought it turned out really nice–the hard part was the chilling! I did tweak the recipe just a bit. We used 2 1/2 packages of Neufchatel cheese and the light version of cool whip. It turned out great. What a decadent dessert! Thanks for the recipe! Hi Susan – I’m glad it worked out well for you guys. Hope the two of you had a fun time preparing the recipe together. Thanks for sharing your results!